Every novel by Tom Clancy has been "a jaw-tightener and a nail-biter of the first order, " as the San Diego Union described Without Remorse. 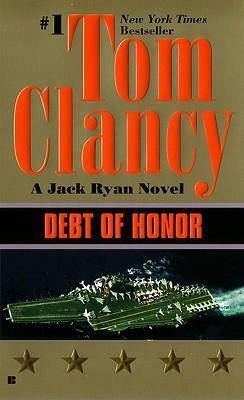 But Debt of Honor surpasses them all, with Jack Ryan facing his greatest challenge - against a peril that may become all too real. In retrospect, it would seem an odd way to start a war. . . . The end of history. The new world order. Fine phrases, but as Jack Ryan is about to discover, history isn't dead yet - and only the nature of the threat is new. On the Pacific island of Saipan, a wealthy Japanese businessman regards his new-bought land with satisfaction. In the Indian Ocean off Sri Lanka, a foreign navy begins a series of highly unusual exercises. At the headquarters of America's major stock-clearing corporation, an engineer brings a customized computer program on-line for the first time, and smiles at his own private joke. Three seemingly unrelated incidents, but all just the first links in a chain of events that will stun the world. Called out of retirement to serve as the new President's National Security Advisor, Jack Ryan quickly realizes that the problems of peace are fully as complex as those of war. Enemies have become friends, friends enemies, and even the form of conflict has changed. What he cannot realize, however, is just how close the next conflict is. And when one of those new enemies readies a strike not only at America's territory, but at the heart of her economy, it is Ryan, with the help of CIA officers John Clark and Domingo Chavez, who must prepare an untested President to meet the challenge, if Ryan can only figure out how. For there is a debt of honor to be paid - and the price will be terrifyingly high. . . .